Went down to a new hunting area looking to fill my fall turkey tag. Here the turkey tags are small designated areas that have problems with wintering turkeys. The idea is to reduce #s of wintering turkeys and push them out of city limits. Arrived early to see hundreds of turkeys located throughout a small town nestled next to mountain range. I saw about 350-500 turkeys milling about on people lawns and in the their small pasture areas, all of which off limits for hunting as it is in city limits and private property. I can only imagine the mess they create, but since you can't hunt in city limits or private property, the fall hunt really isn't accomplishing the goal. I glassed every turkey I could find and all I found was jennys and jakes. I have a goal to be patient and wait for a Tom this year, but I couldn't locate a single tom. I spent quite a bit of time outside of town looking for toms, but all I saw were some really nice mule deer prepping for the rut. After checking out a little parcel of public land off the main road, I see a flock of turkey running out into a newly tilled field on the edge of town. I start glassing and low and behold there are 15 toms all together feeding in the field. I watch them for a little over an hour hoping they move in the direction that I can hunt, but they are joined by another 20 hens and jakes. About to give up and move on, they start moving in the direction I want, now they are running, I start heading to to get ready to cut them off and a farmer enters the field on a motorcycle and pushes them to the edge of the field where they fly up to the juniper and sage brush area. I wait for him to leave the field and he informs me he planted the field last week and had 300 turkeys in the field the day before. He begs me to hunt his fields and keep the turkeys out. After being denied permission to hunt the last 5 times I've ask, it was nice to get an invite before even asking. I move back up to the public land where I think the turkey might have gone and work into the cedars quietly, the turkeys are yelping, putting, kee kee calling and making a ton of noise trying to figure things out again. I get down and quietly wait and it is less than 2 minutes and I see a couple decent toms moving through the tall sage brush about 40 yards in front of me. I wonder if I should be patient and wait for one of the really big toms I saw in the field or take a shot at the average tom I have sitting standing in front of me. Decide a tom in the fall is not an easy task and drop a bird with a single shot from the 20ga with of 1 5/8oz TSS #8s. I stay down and see another 5 or 6 toms run in front of me including one of the really nice toms. 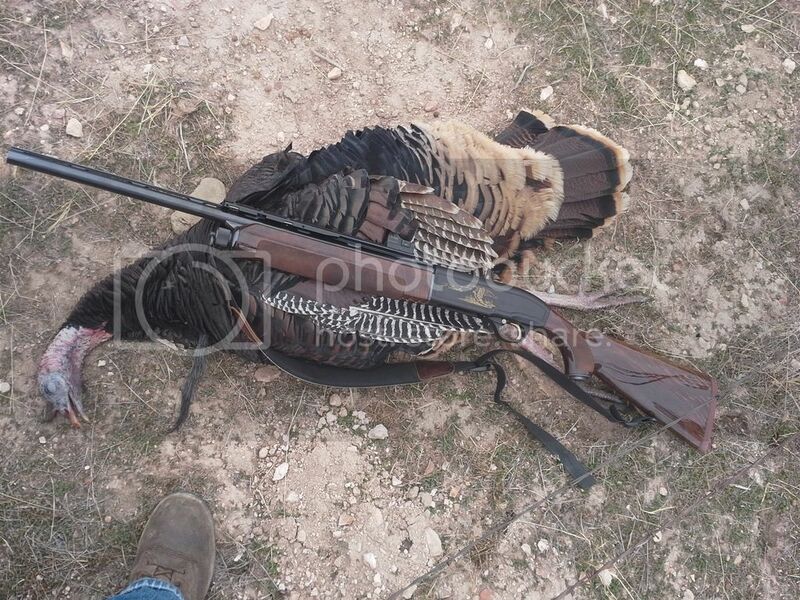 I walk out to find a nice bird with a 9" beard, 20.5 lbs, and just average 3/4" spurs. It is a good solid 2.5 year old bird. Ended up taking me 4 hours to fill my tag and I now have a new field to hunt for the future.On my way out, there were already more turkeys in the field gobbling up seed, I stop and ran through the field to run them off and think the farmer is fighting an uphill battle and will likely loose a lot of seed before it comes up. Nice work Toasty! That's a pretty bird. Nice! Is that a Beretta? Waddle Whacker wrote: Nice! Is that a Beretta? Yep, a 20ga A303 with some nice gold engraving and the 2nd prettiest wood I've ever seen on a shotgun. It is not a ducks unlimited or quail unlimited, but has similar limited edition engraving. Wish I knew a little more about the gun. I had Mike Orlen cut down an extra barrel to 24" and choke it. Shooting a carlson .575 tru choke flush, actually throws a pretty good pattern. congrats Sir and a real nice looking shooting piece there! 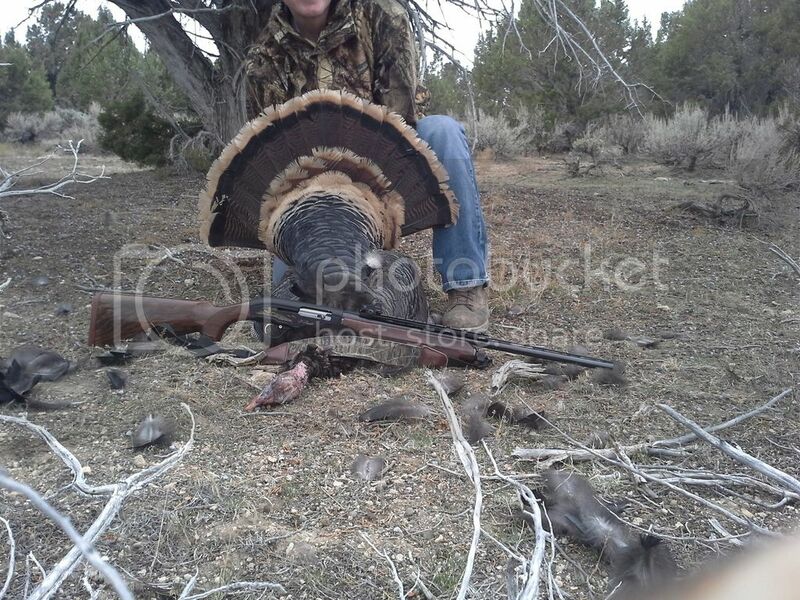 That's a beauty right there, both the gun and the gobbler. I have yet to take an adult gobbler in the fall.